Remembering 2018-19 Bearcats Basketball — OhVarsity! Things were weird from the start. Consider the newly renovated arena. Consider the season started early—in the thick of a wildly successfully football campaign, and not with a snoozer against Albany but against an opponent that hadn't visited the Queen City in nearly 99 years. Consider the 26-game Fifth Third Arena winning streak, up in smoke after the dreariest performance I'd seen in Clifton in years. Consider this all came in Cincinnati's first game following the most gut-wrenching collapse in program history. "Cincinnati was supposed to close the book on Phase 2 by planting its flag at the top of the mountain, finally returning to college basketball elite. That didn’t happen. Gary Clark is gone, and Phase 2 goes out with a death rattle." The Bearcats returned to the hardwood to open the new chapter of Cincinnati basketball, and things couldn't have gone more poorly. "Bearcat fans are not expecting 30 wins for the third year in a row," I wrote following the game, "But a strong showing against an in-state opponent on opening night of the new arena would’ve been nice." What unfolded over the next four months is something I secretly hoped might happen but truthfully didn’t see coming. The 2018-19 Bearcats bucked every expectation bestowed upon them—and brought upon themselves—winning a startling 28 games and racing to a second-consecutive AAC Tournament Championship. It came from all corners. The Bearcats needed an alpha. We all knew it had to be Jarron Cumberland, but the dreadful first half against Ohio State sparked panic before giving way to an uneven stretch in non-conference play: Ten points against North Carolina Central. Twenty-seven against Western Michigan. Three points at UNLV. Twenty-five versus UCLA. By the time January rolled around, however, Cumberland was galloping through the AAC. In a nine-game stretch through February 17, Teddy uncorked averages of 24 points, six rebounds, and four assists while shooting 42% from deep and 76% at the line. The run helped seal his 2019 AAC Player of the Year campaign, which he defended in the tournament championship with a gargantuan 33 points and eight rebounds to will the 'Cats past Houston. He had help from the unlikeliest of places. Keith Williams scored three points in ten minutes per game as a freshman. In a breakout sophomore campaign, he vaulted to a near-double-figure scoring clip, increasing efficiency in all areas. After double-digit performances just twice as a freshman (both against soft non-conference opponents), Williams went for ten or more points in each of the first six games of conference play in 2019. If that stretch wasn't shocking enough, the same kid who shot 53% at the free-throw line in his first season had a month where he went 29-for-32. Reinvigorated shooting seeped into Justin Jenifer's psyche as well. While taking nearly twice as many outside shots as he did as a junior, the senior increased his efficiency by eight percent. His 44% clip was the conference's best. He did it all while touting a 3.9 assist-to-turnover ratio—fifth-best in the nation. The offseason saddled Trevon Scott and Nysier Brooks with the unenviable task of replacing All-Conference players Gary Clark and Kyle Washington. It was an impossible job, and we all knew it. Reducing the departed seniors to numbers is unfair, but Scott and Brooks replaced Clark and Washington’s 24.2 points and 14.2 rebounds with 17.4 points and 13.2 boards, and that's to say nothing of the defensive impact they had. Brooks averaged a block and a half per game—best by a Bearcat since Clark and Octavius Ellis did it three years ago. Scott, meanwhile, averaged nearly a steal per game—the only big man to finish in Cincinnati's top five in that category. The bench was a huge question mark and didn't end up lighting the world on fire, yet still provided enough sparks to make winning feasible each night. Cane Broome, relegated to bench duties after just one game in the starting lineup, opened the year incredibly rocky but regained composure to shoot 39% from outside in the season's final 14 games. His late-game heroics will go down as a major storyline. Eliel Nsoseme continues to play basketball like he just finished listening to three DMX albums, and his January thrashing of USF was one of my favorite performances of the season. Mamoudou Diarra, the Prime Minister of Potential, appeared in nearly three times as many games as a year ago. By season's end, he was a regular part of the rotation, leaving me salivating for what his sophomore season might hold. Logan Johnson did little in the way of statistical production but made many difficult plays look like second nature while igniting a fire in his team and filling a highlight reel. A group that looked haphazard on paper ended up, dare I say, making sense by the time it was all said and done. Jenifer and Scott served as the floor generals and locker room bedrock. Brooks emerged as the enforcer. Williams came out of nowhere as the athletic second option and highlight-reel dunker. Broome unexpectedly reprised his role as sixth man before stepping into the job of heart-stopping closer. Cumberland piloted them all as their fearless leader who brought an edge on the court. The fact that this all fell into relative order means the season deserves to be called Mick Cronin's best coaching job, tournament failures or not. And this is the thing with March. It has an uncanny ability to polish or spoil months of work. When we look back at the 2017-18 Bearcats, the tragedy lies in how our first recollection will be searing heartbreak rather than the 31 days of triumph that preceded it. When we look back at the 2018-19 Bearcats, rather than recalling the 22-win expectations that bottomed out before yielding to 28 wins and another trophy, it's hard to imagine forgetting the Bearcats deflating in a virtual home game in Columbus I paid an excessive amount of money to watch from the arena's very top row. Maybe, though, we can choose to remember something else. I'll try it. I'll try to remember the disappointing opening night that was wiped clean by thrashing Northern Kentucky, Xavier, and UCLA. I'll try to remember the baffling loss to East Carolina and how it sparked the world's most stressful winning streak—eight games that saw two victories in overtime and six by single digits. I'll try to remember Broome icing Tulsa and UConn, Nsoseme battering South Florida, and the comebacks over Temple and Memphis. I'll try to remember Jenifer peeling the roof off The Shoe with the winning trey against UCF. I'll try to remember the crushing end to the regular season immediately followed by three heroic wins in Memphis to bring more hardware to Cincinnati. Sports have an inherently masochistic quality to them, especially at the collegiate level. I care because I chose to be a Bearcat just like these players did, and I can tell I care because of the way the Bearcats bring me incredible happiness and helpless depression, often in rapid succession. I can't blame myself for any of this, because I've already etched my name in granite for next season, knowing full well the road won't get any easier. Nobody knows what the future holds. Should Mick Cronin choose to return—and I think he will—he'll have a chance to win game number 300 in Cincinnati and continue a torrential pace that's seen his team win an average of 30 games over three seasons. 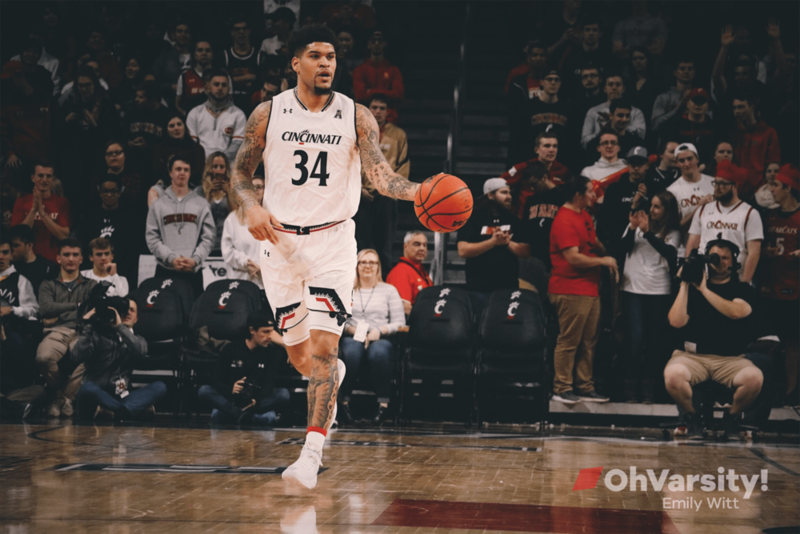 Should Jarron Cumberland return—and I think he will—he'll have a chance to put his name in the annals of Bearcat history with 2,000 career points and more career victories than anyone in the 119 years of Cincinnati basketball before him. They can do it with the help of a proven supporting cast and the program's first Ohio Mr. Basketball. They can do it, maybe even better than this year’s team did. As is always the case when you root for an AAC program operating at 110% capacity—especially one that seems to be continually battling a cosmic grudge—maybe none of this will happen. But maybe we can choose to believe it will. I'll try it.